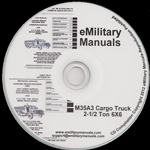 This download has 6 manuals for the general maintenance of the M35A3 Series Truck. In 1994 and 1999 the M35A3 variant was introduced as part of Extended Service Program. Usually, the A3 varieant vehicles have a Caterpillar 3116 Diesel engine and had their manual transmissions replaced with automatic ones, as well as receiving numerous other improvements and a redesigned frontal appearance.